Kirchberg is one of the best-known ski villages in Tyrol. 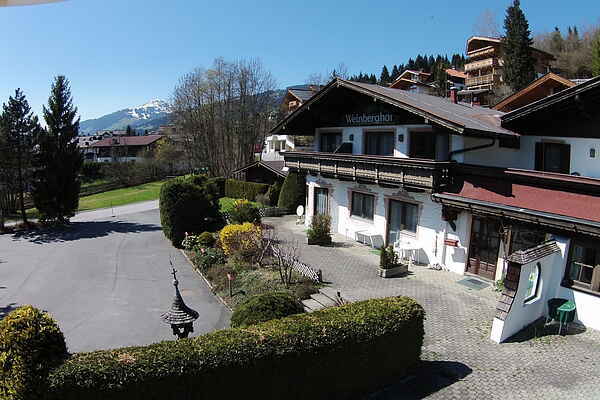 It is in a fantastic setting in the heart of the Kitzbühel Alps, at the foot of the Hahnenkamm. A true paradise for skiers thanks to the connection with the Kitzbühel and Westendorf ski area as well as all the other well-known ski villages in the area. Kirchberg is also known as a vibrant destination with lots of après-ski bars. Weinberghof is a detached holiday house located just 500 metres from the charming town centre. It is perfectly situated on the sunny side of the valley with a great view of the surrounding mountains. You will have the house entirely to yourself, so privacy is guaranteed! The spacious holiday house (500 m2) is spread across four levels, with no fewer than 12 bedrooms, 8 bathrooms, a kitchen and two living rooms at your disposal. Not to mention your own home cinema and separate billiards room. You can also enjoy a large wellness are with a sauna, showers and a relaxation room which is a great place to get together after a day of activity. The biggest ski area in Austria is within easy reach. Here you will find Kirchberg, Kitzbühel, Westendorf and Ellmau, among others, with a total of 247 lifts and 676 km of ski runs! All in all an ideal holiday home for larger groups.